The Casey Key / Sarasota area is truly a birder's paradise. Most birds are present throughout the year with a peak time during the spring and fall migrations. Winter means good birding because the population swells with the winter visitors. Florida's indigenous species are here in the summer along with those birds that come to nest in Florida during the summer. Florida has been blessed with large diversity of birds in the nation - more than 480 species with about half which can be found on Florida's Gulf Coast. 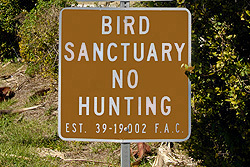 The Casey Key / Sarasota area is nationally recognized as one of the top birding areas in the nation. Birding is one of America's fastest growing outdoors sports. There is no better place to start birding than the Casey / Sarasota area. Sarasota Keys - Casey Key, Siesta Key, Lido Key, Longboat Key, etc. Celery Fields - Located at Fruitville Road and I-75 in Sarasota. Myakka River State Park - Two lakes and river that flows between them makes this an idea location to view waterbirds. Oscar Scherer State Park - Located on US 41, in Osprey. Shamrock Park - Located in Venice. Venice Rookery - On U.S. 41 just north of Jacaranda Boulevard is a small island in the middle of a lake in Venice. Crowley Museum and Nature Center - Half mile boardwalk cuts through the heart of a mixed-hardwood swamp in Sarasota. For more birding information see the Venice Area Audubon Society web site which serves the area including Venice, Nokomis, Osprey, North Port and Englewood Florida.